I receive my high school diploma from Prescott High School in 2006, earned my first Associate of Arts degree from Yavapai Community College in 2012, earned my second Associate of Arts degree from Mesa Community College in 2016, and am currently pursuing a Bachelor of Music Education degree at Ottawa University. 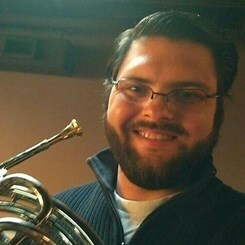 I studied Horn performance at Northern Arizona University with Nancy Sullivan, took lessons from Steve Rumbold at Yavapai Community College, and am currently working with Nathan Mitchell at Mesa Community College. I have also had the opportunity to study under several extremely skilled professionals throughout northern Arizona and the Phoenix area, including Richard Longfield, Mike Vax, Paul Manz, Emery Harvison, Paul Brewer, and Robert Hunter, as well as many others. Over the years, I have had the opportunity to perform with a vast array of different ensembles ranging from beginning bands to professional orchestras. I spent three years at Northern Arizona University, where I played with their symphonic band, marching band, and horn ensemble. I moved to Prescott to continue my education and spent four years performing with the Yavapai College orchestra, symphonic band, jazz band, and a horn ensemble I helped create. While in Prescott, I also played with the Prescott Pops Symphony, which is Prescott’s professional orchestra. I got to play back-up for Toni Tennille during one of our concerts, which was a fantastic experience. After Prescott, I moved to Tempe where I began performing with Mesa Community College. I have played there for the past two years and am currently performing with their concert band, community band, orchestra, horn ensemble, brass ensemble, and woodwind quintet. MCC has afforded me many chances to perform with several well-known musicians, including William Joseph and David Ellefson. I worked as a visual, technical, and musical advisor with the Pride of Prescott Marching Band for four years. It was a wonderful experience that gave me a chance to teach on a very large scale. For the past two years, I have been the assistant horn instructor for the Mesa Community College Summer Band Camp, which has given me the opportunity to develop my small-scale and individual teaching styles. As part of my education degree, I have spent the past six months working with the beginning band programs at Gilbert Elementary School and Ashland Ranch Elementary School, which, once again, has provided me with insight, this time into how to educate and work with beginning students. My teaching philosophy is based on the idea that music, as an art form, provides individuals with the opportunity to express themselves in ways that no other medium can achieve. Music is a direct line to the emotion within us, giving sonorous voice to the tumult and chaotic joy of our inner selves. My philosophy is to strive to remember this concept throughout every stage of a student’s musical education. I respect the fundamentals and mechanics of performance, and seek to promote mastery of those aspects in my students, but I also remind them to express themselves artistically. I teach with respect for the unbroken line of musicians that stretches back across eons of time, with reverence for our ability and desire to decorate the air with glorious sounds, and with recognition that each of my students, if they are dedicated, is capable of achieving greatness.